MathGuy.us was created to provide FREE MATERIALS for use by math students, parents and teachers. You may use these materials free of charge as long as you are using them for educational purposes in a public, private or home-school setting. This includes tutoring and other educational activities for math students, but not for-profit business entities. If you have a question about the permissible use of these materials, please email Earl at mathguy.us@gmail.com. In order to access much of the material on this website you will need the free Adobe Reader, which is already installed on most computers (PCs and Macs), as well as many tablets and smart phones. If you do not have the Adobe Reader installed on your device, you may download it at get.Adobe.com/reader/. Note: to avoid installing more software than you want, unclick the boxes under "Optional offers" (middle column) when downloading the Adobe Reader. Education requires us to think, not just react emotionally to issues as important as the basis upon which America was built. Read these articles to see what Socialism is like in practice, not just in theory. Also, do a little research on what it is like to live in China, Russia, Cuba and Venezuela. If you can, visit these countries and report back to the rest of us. Think about this: How hard do you work now so that you can have a better life in the future? How hard would you work if the benefits of your work did not go to you, but instead were given to others who don't work as hard? I suspect you would not work as hard and you would not make the sacrifices you make now if you did not benefit as much from your own hard work. Now, consider what would happen if an entire society chose not to work as hard as they do now because they did not benefit directly from their own work (look up the concept of "Adam Smith's Invisible Hand"). Would that society be exceptional? Would it be one where the poor could raise themselves out of poverty with education, sacrifice, and hard work? Would it be one where you would challenge yourself to become the best that you can be? Is that a society in which you would choose to live? Success Tips – Tips for success in upper level math classes, including a list of common errors and how to avoid them. Marijuana linked to brain-related memory woes, schizophrenia risk in teens – Young people, please read this article, and stay away from things that reduce your brain function. 2015 U.S. City Education Rankings – Results from a WalletHub study that ranks the education level of the top 150 U.S. Metroplitan Statistical Areas. Trigonometry - Key Formulas and Relationships – A 2-page summary of key formulas and relationships from the Trigonometry Handbook and more. 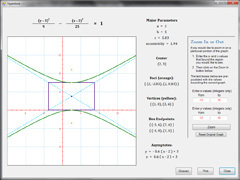 Algebra (Main) App version 0.8c – updated February 16, 2015. Note: when started, this app may take a few minutes to open. It is very large, so please be patient. I hope you will find it worth the wait when it opens. Calculus Handbook version 4.5 – updated January 2, 2019. DRHS Calculus Students - click here for access to homework solutions - AB and BC. BC students, the Series review packet is with the other BC homework on the Calculus page. Note: TI has updated its nSpire CX CAS Operating System to version 4.5. You may want to install it on your nSpire. Using the TI nSpire Handheld version 2.1 – updated October 2, 2016; download as a Word Document or as a PDF Document. Powerpoint Introduction to the TI nSpire CX CAS. Using a Table to Approximate a Limit - added August 16, 2016. Limacon Areas – Development of the area between the loops of a Limacon. Taylor Series – Two developments of the Taylor Series formula, an example of how to create a Taylor Series using a table, and an example of the Lagrange Remainder. Power Series to Memorize – Memorize these power series to enhance your AP Calculus BC score. Includes a table of series to memorize and a blank table to practice with. Below is a description of the materials available on this website. They were developed over a period of years during which Earl has tutored math at the Damonte Ranch High School in Reno, Nevada. 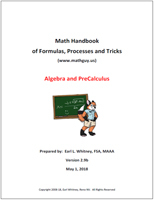 We have included math handbooks that can be used as references for many math classes, PC apps developed to help the student "explore" math, answers to sample exams on numerous topics, Excel files to deal with specific math issues, and much more. We welcome any comments or suggestions to improve the materials; please send an email to the above address and we will see what we can do. The Math Handbooks cover Pre-Algebra, Algebra (through Pre-Calculus), Geometry, Trigonometry and Calculus. They began as a set of explanatory notes for tutoring students. Over time, we accumulated enough notes to organize them, eventually filling in any significant gaps to get a fairly comprehensive set of materials for typical high school and elementary college math classes. The handbooks, in aggregate, contain over 600 pages of material, organized (to the extent possible) in one- or two-page segments by subject area. The intent is that a student needing a reference for a particular issue in math would be able to print one or two pages that would help them learn how to perform the task at hand and that would serve as a reference whenever one was needed. To visit the Math Handbook download page, click here. The Math Suite of Apps is a set of software programs designed to help students learn by "exploring" the math they are learning. For example, if you graph a hyperbolic function based on a certain set of parameters, what happens to the graph if you change those parameters? Using paper and pencil, this could take a long time to investigate, but using an app, the answer appears in seconds. The same holds true for changing the slope of a line, selecting a different variable to eliminate in a system of equations, and many other areas of math. Our hope is that the apps will enhance learning of some of the more difficult parts of algebra and related subjects. Basic Algebra App – primarily relating to all aspects of numbers. Algebra (Main) App – main Algebra app for Algebra 1 through Pre-Calculus. Trigonometry App – app relating to Trigonometry. This app is limited in scope at the moment, but covers a number of key concepts in its current form. GraphPaper App - app to create graph paper in either Cartesian or Polar form. Speed Practice App (see below) - app to improve your arithmetic skills. The apps are in development, so not all planned capabilities are available yet. The version number of each app is provided on the opening screen for that app. You may download the apps and use them to help you explore mathematics. They are designed for use on the PC, and are not available for Apple products. To learn more about the PC Apps or to download them, click here. This section organizes the site's materials by course, and includes sample tests with step-by-step solutions for many courses, including Trigonometry and AP Calculus. Information relating to the Nevada High School Proficiency Exam, including sample tests, is also provided. In addition, we identify a number of publications from other sources that may be useful references to math students. To visit the Math by Subject page, click here. Success in math classes can be enhanced by increasing your ability in arithmetic, both in accuracy and in speed. A number of Speed Practice files are provided to help you do this. Choose from a Microsoft Excel file that allows you to generate problems and print them (both problems and answers) or a PC App that allows you to work on your computer screen (or download both). Either way, using these files will help you improve your arithmetic ability so that you can spend more time learning math and less time struggling with arithmetic. To visit the Speed Practice download page, click here. This section provides "tidbits" of mathematics that we have found interesting and have investigated to some degree. Also, will provide essays on subjects related to education in general and math education in particular. We hope you also find them to be of some interest. To visit the Math Tidbits page, click here. To locate tutors in math and science in your area, please contact your local high school or college. Tips for finding the right tutor for you are provided on this page. A listing of colleges/universities and high schools in the Reno, Nevada area are provided here.